Coffee is good for more than early morning or late afternoon jolt of energy. Take it a step further to reuse coffee grounds long after your cup of joe is gone. Today we’ve put together a ton of awesome reasons to never toss out those used coffee grounds again. So, let’s get grinded. You can read the text or just watch the video. If you spread out coffee grounds on a baking sheet and allow them to dry, they can actually be used much like baking soda is for absorbing food odors in the refrigerator. Just load up a small open container with old grounds and place it in the back of the fridge for several weeks while you accumulate more grounds. While you’re at it can also funnel dry coffee grounds into an old clean sock and tie it off before placing it in your freezer to neutralize those odors as well. If you’re chopping up potent vegetables like garlic and onions or handling raw fish, coffee grounds can actually help remove the strong stink from your hands. Keep a container of coffee grounds near your sink so that you can cover your hands entirely and then just gently scrub them together with a little water. Smell begone! You can also make your own coffee hand scrub by combining one cup of old coffee grounds with a cup of coarse sea salt. Just add in a cup of coconut oil and mix it all together well in a big container. The abrasiveness of this natural hand scrub will wipe away dirt and grease and exfoliate your hands making them looking nice and shiny and clean. Now here’s an interesting way to reuse coffee grounds you may not have known. The scrubbing power of coffee grounds is amazing for scouring pots and pans and even cleaning your stovetop. 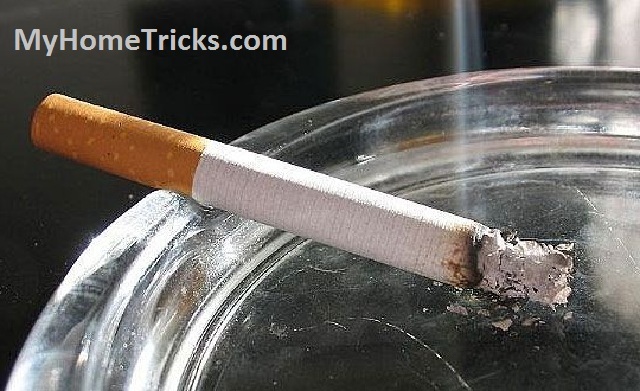 Cover a thin cloth with coffee grounds and scrub it over the stubborn grease and food particles. Before long your dishes and stovetop will be sparkling clean once again. It’s a true toward a force of scrubbing action. One amazingly simple way to deter pests from eating your vegetation is to sprinkle used coffee grounds throughout your garden all around your plants to create a barrier and then protect them against destructive ants bugs and even slugs. By spreading coffee grounds all over plants and flower beds that thrive on the acidic nature of coffee grounds, you’re actually gonna end up with a more vibrant and healthier garden altogether. Your used up grounds also make for an excellent fertilizer as well, because they’re rich in nitrogen. If you don’t have a use for your coffee grounds right now, go ahead and add it to your compost bin for later that way. If you’re gonna do some gardening, you’ve already got your fertilizer on hand. Or hey, maybe you could just give it to your neighbor, if they’re doing a project as well. But if you’re not exactly sure what you might use those coffee grounds on in your garden, think about this; if you have dead spots in your grass that could use a boost, use some of that compost you just made as fertilizer and mix it into your lawn. With the right balance of green and brown matter, it’ll help revitalize your grass and likely attract beneficial worms to your soil as well. Reuse coffee grounds to make coffee scented candles. If you love the smell of coffee, why not I turn your old grounds into an all-natural homemade candle. Using either the double boiler method or your microwave for about 90 seconds, melt candle wax to about a hundred and seventy degrees. You can also add your own cents to the wax if you like. While you wait for the wax to cool down to about a hundred and fifty degrees (Fahrenheit of course) add a wick to the center of the jar and then slowly pour in a layer of wax. Follow this up with a scoop of coffee grounds. Let it all pull for about a minute before repeating this process until you fill your container up entirely. You can, of course, sprinkle additional coffee grounds on top to give it an artisanal look. Then just cut the wick to size and you’re left with a coffee scented candle that sure to cost more to buy than it did to make. Especially since you repurpose those old coffee grounds. If you’re not a huge coffee drinker to reuse coffee grounds, don’t worry, many local shops including some Starbucks and McDonald’s will happily give you bags of used grounds. If you want to use them for your home or your garden, so just ask them next time you’re around there. 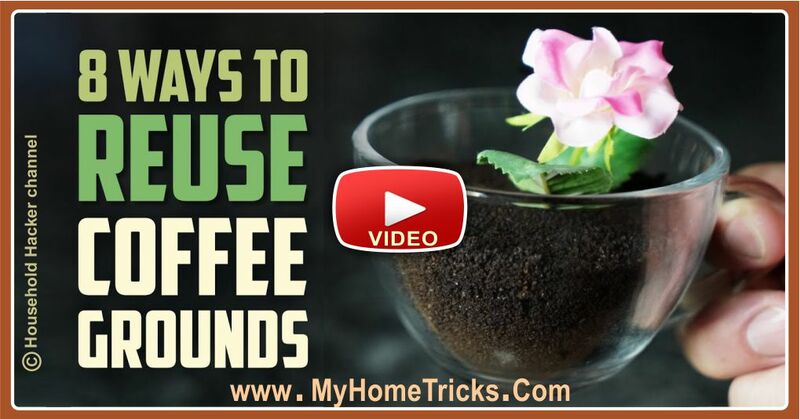 I hope you will like this “6 Smart Ways to Reuse Coffee Grounds” video. © NOTE: All property and copyrights of the materials belong to their respective owners, and no copyright infringement is intended. We fetch this video from “Household Hacker” channel on Youtube, along with its own ads. The use of the video here via the embed codes is not done with the intent of copyright infringement. The ads on the video do not belong to us.